Note: Although this recipe produces good fritters, I’m still trying to work out the kinks in order to make them a bit lighter in texture. Defrost spinach and press out as much water as possible. Mix dry ingredients together in one bowl. 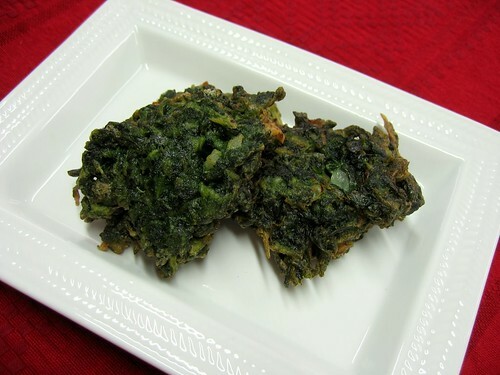 In a large bowl toss spinach and onion together. Next add milk and egg to spinach, mix well. Finally, mix in the dry ingredients. In a large deep frying pan or sauce pan, add a little over a half inch of oil. (Be sure to use a pan deep enough to prevent oil from splattering over the edge!) Heat oil up to 350º F (176º C) or hot enough so that if you dip the tip of a toothpick in the oil, bubbles will form rapidly. With two metal soup spoons, use one to scoop up dollops–a little larger than the spoon size–of the spinach batter and the other to scrap them off into the oil. Fry in small batches. After a couple minutes, flip and cook for the same amount of time. They should be ready when the outer part starts to turn golden. Drain on towels and serve warm.